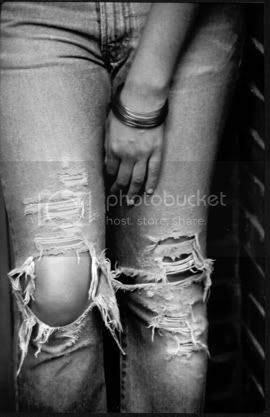 Ripped jeans have been worn as a fashion statement since the 1970's. During the 1970's many chose to deform their jeans in an effort to separate themselves from mainstream culture. Ironically, the mainstream eventually embraced ripped jeans. Today ripped jeans and patched jeans have become part of the fabric of American culture. Both styles are now welcome in places that range from the dorm room to the board room, the art studio to the art opening, and the vegetable garden to the garden gala. The truth is, we just love to abuse our jeans. Since their invention, jeans have been ripped, bleached, shrunk, permanent pressed, cut off, torn, shredded, distressed, sanded, stone washed, and acid washed. On the other hand, they've been lovingly embroidered, beaded, patched, painted and sequined. We definitely have an intriguing relationship with our favorite article of clothing. Through the good times, and the bad ones, our loyal jeans still love us. And we still love them. Which reminds us, in the 1970's, during the height of the free love movement, the US also saw an outpouring of denim love. Americans were using their jeans to visually express their hopes, political views, and religious beliefs. In 1974, Levi's held a denim art contest and received thousands of entries. The worst part (or best part!) is that people actually wore these jeans. That's right, take a look at the bad boys and their jeans from Levi's Denim Art Contest Catalogue of Winners by Richard M. Owens, Baron Wolman, John Burks.